My husband went hiking this morning and I got up early so I could see the sunrise. It was gorgeous. I’m go glad I bothered to get my rear end out of bed. We have been on Maui for a month and we go home next week. I’ve seen and photographed lots of sunsets. But a sunrise is different. It is more delicate. It comes in so subtly. No matter how you edit it, it stays very soft and simple. Sunrise is a great time of day. No one is out and about. You can sit and drink your coffee and no one bothers you. It was just me, Maalaea Bay and this beautiful sunrise coming up over Haleakala volcano. To say I don’t want to go home next week is putting it mildly. In the 80’s some time I was in a hurricane while on Maui. It completely destroyed Kaui and we only had very high winds on Maui. The next morning the beach was covered thick with shells. What a find! My mother and I grabbed up all the shells we could get our hands on. I doubt I would do this today. These shells are needed by sea creatures for homes. They are part of the sea’s eco system. But I didn’t understand that when I was younger. That you go to the ocean you look, you enjoy, but you leave it there. Today, we have digital cameras to capture the beauty of places we visit. There is no need to collect things and bring them home. I enhanced this photo in Enlight, then TangledFX. Aloha means more than hello or goodbye. It’s a feeling, a way of being that exists on Hawaii. We are very blessed to have Hawaii as one of our states. I am very blessed to have now visited Maui 17 times. This trip my husband and I are here for two months. When you stay in one place for that long you take a completely different approach to your trip. Especially on Maui. It is not one big whirlwind of activity. We get a chance to really relax into Maui and feel the Aloha. I think of Maui as my spiritual home. Warren and I are going to renew our wedding vows on the beach this year. We celebrated 40 years being married last May. It felt like a good thing to renew our vows. So to celebrate that occasion, I told Warren it was way past time for me to have a new wedding ring. Poor guy didn’t know that you reward a good wife of long standing with a new ring. Husband who doesn’t get a trophy wife has to buy a trophy for the wife of long standing. It made perfect sense to me and I got a pretty new diamond ring. This is a hibiscus I photographed at our condo grounds. It is the most beautiful color of pink. I have to say that I am feeling so much better. Better than I have felt in 20 years or so. Lyme disease, which I have in addition to fibromyalgia, has more than just one germ that needs to be eradicated. Finally, my lyme physician has put me on yet another antibiotic that treats one of these germs. I have had an amazing reaction to it. While I was in Maui in October and November, I was able to walk one and one-half miles. This may not sound like much to anyone. But for me, it has been amazing. I haven’t been able to walk much more than about two blocks or so at a time. Yes, I have walked longer at times, but then came home exhausted and would have to rest for many days, sometimes, weeks. But in Maui, I did this and was able to keep going back for more. Inside of me there has been this heaviness, that pulls me down. It has been there for over 20 years. That is finally going away. This is very exciting for me. My creativity also seems to be increasing. That is really exciting. As to this painting. I started it in Rebelle with watercolors. I just poured on watercolors in various bright shades and made them very thick and let them pour down. Then, I took the painting into Painter. I used some of Painter’s new brushes called Dynamic Speckle brushes. I used them to further refine the shapes that I found. Then I took pencils and did some outlining of shapes. This was a very fun painting to do. I gave it this name, because I started it on a very dark dreary day, and I was dreaming of bright colors that hopefully will come after the first of the year. This is a painting I did while we were still in Maui. I was very influenced by the gorgeous flowers in Maui. 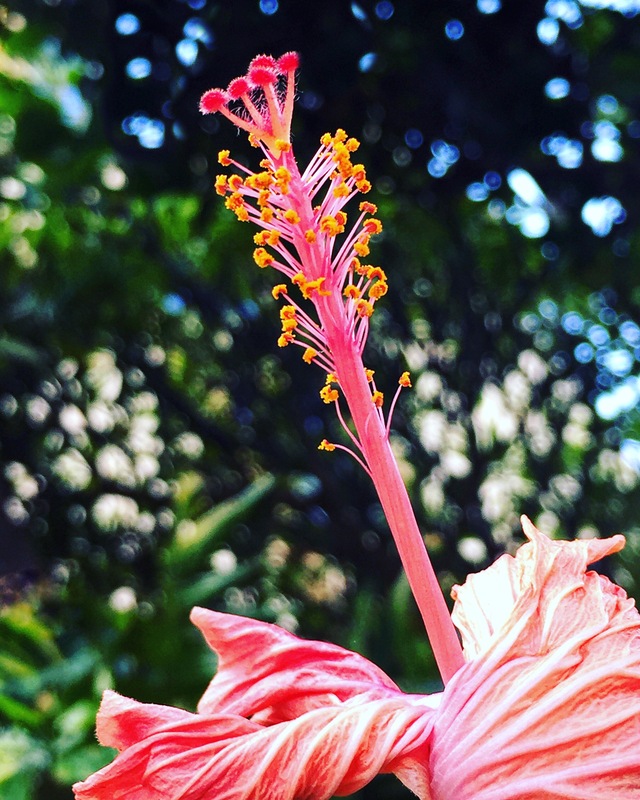 Tropical flowers are so bright and have such beautiful shapes. I think of this as abstract flowers. I was showing more the shapes and colors than actual flowers that I saw. I work on my abstracts in layers. I start with a painting in Rebelle, making lots of drips and using the pen to make lots of lines. Then, when I bring the painting into Painter, I look around for shapes and colors that I like, and that is how my paintings grow. I started this painting in an app called Rebelle. I used watercolors and inks and created lots of drips. Then I painted with a watercolor brush loaded with lots of paints and drew in various shapes. Then, I took it into Painter 2016 and used pencils and acrylic paints to finish the piece. I like using pencils in lots of different colors in my paintings. It seems like a great way to spread color around in a painting. I like this particular painting because it has a lot of very bright colors. I painted it while we were in Maui recently. I think all the beautiful tropical colors there influenced me. This is a painting I did while we were in Maui during October and November of this year. I haven’t been painting very long, only since September of 2012. So, maybe what is difficult for me, is old hat to other artists. Although, I think that most artists have the same recurring difficulties that I do. I can often get myself to think I’m not a very good artist. I know I’m no Gauguin, although I would like to be. But, I think my painting is pretty good. I know that it makes people happy to look at it. I know it is cheerful and filled with bright, beautiful colors. But there are days, and it happened in this painting where I think I’m horrible. I get to a certain point in a painting, and it become difficult and challenging. This is when I can tend to beat myself up. I don’t get too severe with myself. I told myself a year ago, that if I continued to do that, I would have to give up art. I was making myself too miserable. But when this painting got about 3/4 done, I became very frustrated with it. But I finally worked my way out of the little snit and finished it. I used some new brushes in this painting. They were made by a friend who has Painter. They are Liquid Brushes. They are a very old technology in Painter. So old, in fact, that they do not paint on layers. But they were fun brushes to use. They make a very nice bristly stroke.